Was it a wave or just rearranging deck chairs on the Titanic? The following is a term limits discussion between Nicolas Tomboulides, Executive Director of U.S. Term Limits and J.R. Hoeft on his podcast. Listen to the episode in its entirety here: https://jrhoeft.com/2018/11/19/nick-tomboulides-u-s-term-limits/. Nick T.: … getting legislatures who are actually closer to the people and have to appeal to voters. They can’t just rely on PAC money. They can’t just rely on name recognition or sending mailers out of their federal offices to get re-elected. They’re actually going to have to depend on voters. They’re actually going to have to listen to the issues that voters care about, and they’re actually going to have political courage to tackle some of those big problems like the national debt. J.R.: Welcome aboard it’s episode 58 of the J.R. Hoeft Show. Happy to have on the podcast this week Nick Tomboulides of U.S. Term Limits. He is the Executive Director of that organization and, while most of us would construe what happened this past election cycle as a blue wave looking at it through our team lenses, aka a rivalry between like Alabama and Auburn, Michigan/Ohio State, Yankees/Red Socks kind of characterization, Nick takes a little bit of a different perspective. He doesn’t see it as necessarily as a blue victory. He sees it as a win for the power of incumbency, that perhaps just the deck chairs got rearranged just a little bit. Those who have been in power for a long period of time are about to get power again. You just changed it from an R to a D. Nick comes on the podcast today to explain why he thinks term limits are extremely important. Why there is a great deal of bipartisan support for the notion, how he feels the project is moving forward, particularly with the idea of having a constitutional amendment that imposes a three-term limit on Congress. J.R.: He explains why that’s sufficient. He also explains that despite the fact that maybe three Republicans lost in Virginia to Democrats why that’s not necessarily indicative of the larger picture that’s going on. Great conversation with Nick Tomboulides of U.S. Term Limits. Happy that he was on the podcast. Don’t forget to like and subscribe to this show and share it where you can. We are available on Apple podcast, Google podcast, Stitcher, and a whole bunch of others. You name it, look for us on your favorite podcatcher. Like, share, review the program. Greatly appreciate it when you do that. Without further ado, let’s get underway with Nick Tomboulides of U.S. Term Limits. Nick, how you doing? Nick T.: Hey, J.R. Doing well. Glad to be on the show. J.R.: It’s great to have you on the podcast. I’ve got to tell you, I am now a huge fan of the No Uncertain Terms podcast. You guys do a phenomenal job with that podcast. My congratulations to you and Philip and the entire team. Nick T.: Thank you. Yeah, we’re really excited about it. We’ve already gotten charted a couple of times on iTunes. It’s absolutely gaining a lot of momentum. It’s an area within the political sphere that has really been underserved by a lot of the existing media, politicians, pundits, and podcasts. We’re getting an amazing reaction to it. The thing I like the most is that we are totally bipartisan. We appeal to people on both sides of the political spectrum who are fed up with the existing political system and wanna see it work more, be more accountable to the public. We’re generating very bipartisan strong audience reaction. J.R.: Well, it’s a good podcast and just as someone who’s somewhat of an audiophile myself, maybe you don’t realize that by my own podcast, but production value you guys have invested into this is fantastic. The editing is tight. Just the transitions are wonderful. It’s really just a very entertaining show to listen to and, of course, the content is great too. Nick T.: I try to give them creative direction on that. As you know, I’m a panelist, sometimes cohost, of the podcast, but I can’t claim credit for all the production values and transitions and such. That’s definitely credited to the amazing team that we have working behind the scenes on it. Yeah, great to hear the feedback. It’s awesome. J.R.: Again, folks, if you have not listened yet to the No Uncertain Terms podcast you want to check that out and make sure you listen to it through our show notes, available here on the show. Let’s get to you. Talk about why you have found yourself, Nick, at U.S. Term Limits. Nick T.: I used to be more of a political activist for kind of traditional causes that you would think of as more partisan. Some of them on the right you’d think of such as like tax reform, some of them on the left like you’d think of criminal justice reform. Over time, what I realized is that I would not be able to make an impact for the causes I believed in for as long as our Congress was primarily controlled by self-interest and ambition. By that I mean the objective for most Congress members is not to solve problems. In some cases, it’s actually to perpetuate problems, so that they have a reason to run for re-election in perpetuity. It becomes more of a system of self-enrichment. What I realized was I was getting nowhere. I was banging my head up against a wall trying to elect a new captain of the ship to steer it in the right direction. The problem was the ship itself. The problem was the structure of the system we have in Washington. Nick T.: Until you change the structure you’re not going to be able to achieve any kind of significant policy victories on the issues you care about and believe in, regardless of whether you’re a Republican or a Democrat. I started working with U.S. Term Limits, started volunteering. I was the Florida State Director for U.S. Term Limits for some time and then gradually worked my way up to Executive Director, where I now manage this entire organization, including our big project, which is to put term limits on Congress through a constitutional amendment. It is very rewarding work. Everywhere I go I get “Atta boys”, pats on the backs. We’re the most popular bipartisan issue in the country. We have 82% support with the American people and we’re just trying to get the politicians to do the right thing, sometimes even for the wrong reasons, and propose a term limits amendment. Nick T.: We think it would be good for our country. We think it would be very unifying. What you see is politicians run for office and they say, “I really want to work across the aisle. I really want to work with the other side.” Well there’s no issue that bridges the divide better than this one. We try to encourage politicians to do the right thing and help us reform the system. J.R.: Absolutely. You almost caused a traffic accident this morning because I was listening to your podcast on my way into work and I heard the fact that Ed Rendell and one of the Daly sons in Chicago are now basically in favor of term limits, which coincides with a pledge that Republicans made way back with the contract for America to say that, yeah, indeed, term limits should happen. Do you get the sense that Americans are frustrated with the House of Representatives being elected in perpetuity? Nick T.: Yeah, I think so. Going back to what you stated, Bill Daly, brother of Richard Daly, and son of Richard Daly Sr. who had collectively governed Chicago for over 40 years, coming out for term limits is really a remarkable thing. He was also Barrack Obama’s Chief of Staff, by the way, for a few years. It really shows you the bipartisan [inaudible 00:08:34] that this issue has. Go back to Congress though, look at the re-election rate. The re-election rate, on average, since 1970 has been about 95% every two years for the House of Representative. In recent years, it’s actually gotten even higher. It was I think 98% in 2016. Based on the results of this election we had two days ago, it’s probably gonna be a little bit lower, but not much lower. What we see is even when there’s wave election, even when you change from Republican to Democrat it’s really like a football game where you’re just changing possession of the ball. Nick T.: It’s the same players on the field, it’s the same career politicians who’ve largely been around for two or three decades in leadership, folks like Nancy Pelosi, for example, or Mitch McConnell, and you find that not really a lot changes when control of Congress changes. You have to have all the stars aligned, with regard to the president and having one party control to really get anything done in Washington. Most of the time all we see is gridlock. When we do see changes it’s not really anything that strikes at the heart of the problem. For example, we have a national debt now that is between $21 and $22 trillion dollars. That’s really a threat to our national security. We’ve had experts say we can’t possibly sustain this debt for much longer, yet members of Congress are afraid to look at the idea of raising any taxes. Democrats are afraid to look at the idea of cutting spending. That’s because their first priority is not solving that problem, it is keeping themselves in office and they’re unwilling to do anything that might jeopardize those cozy little positions they have in D.C.
Nick T.: The voters understand it. The voters are very, very frustrated. That’s why, despite having a 98% re-election rate, Congress has about a 15% approval rating. They are less popular than head lice. They are less popular than root canals and Nickelback. That’s how badly Congress is performing with the public. Something has to change. I mean I think we need to turn it back over to citizen legislators who know that their job is to solve problems and then come back to live under the laws that they made. J.R.: Well, in Virginia you like to think that we’re a microcosm of the United States. We pride ourselves in that. We had three very interesting elections that occurred here at the congressional level. One was the giant killer himself, Dave Brat, who unseated the majority leader, Eric Cantor, in a primary, just two terms later was defeated by Abigail Spanberger in a race. Then you had Barbara Comstock in the 10th, again, two terms after a very long-serving incumbent, Frank Wolf, was defeated because “the president called her out”, not embracing the president’s policies or embracing him. You figure that out, which one it is. Then down here in Hampton Roads area, where I live, you had a one-term congressman who it’s kind of weird and I don’t know how familiar you are with the story, but a gentleman by the name of Scott Rigell had served there for several terms, decided himself to term limit himself out, retired. He was a business man. He got fed up with the situation. Taylor came in and kinda’ had this aura of a career politician about him, but after one term he was thrown out. J.R.: The reason I mention all these things is it seems like the electoral process itself without having any specific limits on it managed to kind of solve the problem. How do you counter that argument? Nick T.: I would counter that by saying we have to be careful not to let exceptions prove rules. An average election cycle there are fewer than 20 seats in the House of Representatives that are truly contested, meaningful, competitive elections that are up for grabs. That is less than 5% of the elections for the House that are truly competitive and meaningful. Meaning in that in the rest of the elections voters really don’t have much of a choice. They’re either dealing with an incumbent who is unopposed, I think they are usually about 40 to 50 House races that are unopposed every two years meaning your incumbent is on the ballot, you have no possible recourse or mechanism to vote them out. Then there are many more races that are under opposed, meaning that an incumbent is running, they have a challenger, but the challenger is typically just a gadfly candidate who has opened a bank account and thrown $5,000 or $10,000 into it, and is not running a real campaign. They don’t have a website. They don’t have issues. They’ve given you no reason to really vote for them. Nick T.: Then there are the competitive races that you just identified. Again, in a given election cycle, on average, less than 5% of all the house elections are competitive. In what we would call a wave election, like the one we had on Tuesday, about 15% of the elections are competitive. For the majority of Americans they are heading into the ballot box every two years already knowing who’s going to win the election, not feeling inspired by the political process in any way because the incumbents have the stranglehold on those seats. You mentioned Dave Brat. He did beat a sitting House majority leader. I think that was the first time that had happened in over 100 years. If we’re really seeing true meaningful turnover at the congressional level on a regular basis then maybe that would alleviate, not eliminate, the need for term limits, but we’re still not seeing it despite those exceptions you mentioned. J.R.: Speaking today with Nick Tomboulides. He is the Executive Director of U.S. Term Limits. Nick, let’s change gears just a little bit and talk about what you guys are trying to do with U.S. Term Limits. I’ve heard some things regarding a U.S. Term Limits Day. You’ve had some sort of motivations to try to inspire the American people to focus on this issue. Are you seeing it? Does this election continue to inspire that thought? Nick T.: Absolutely. Absolutely. I think that you’re seeing term limits is becoming more of a front burner issue. Dissatisfaction with Congress is at an all-time high. A majority of Americans when polled say they would press a button to fire every congressman if that button or option existed. We’re seeing term limits is more of a factor in congressional races. One example I will give you is the U.S. Senate race here in Florida, between Bill Nelson and Rick Scott. Term limits were the centerpiece of Rick Scott’s campaign. Every single Rick Scott ad was about term limits. Bill Nelson has been in politics for 46 years. He was first elected in 1972 actually from the State House district that I’m living in now. Since that time, he’d run for 5 different offices and been elected 15 times, including to the Senate for 18 years. Nick T.: The anti-incumbency fervor is playing a huge favor here in Florida, likely gave Rick Scott the win, still being counted. Martha McSally out in Arizona was also term limits supporter. She signed the term limits pledge. Her opponent refused to support it. The term limits super pack went out and ran ads against Kyrsten Sinema for refusing to support the issue and now it looks like McSally is going to pull off a victory there by a slight margin. We are seeing term limits as a factor. Not only does the public support it over 80%, but they also support it with intensity. About 60% of those people say that it’s a very, very important issue to them. President Trump came out for it during the 2016 campaign. After the election, Barrack Obama came out and said we needed term limits on Congress. Nick T.: The enthusiasm is ramping up. What our organization’s looking to do is pass a constitutional amendment to term limit Congress. There’s only two ways you can do it. The first is with a two-thirds vote of the Congress. We’re not very bullish on that. We feel like that’s like getting chickens to vote for Colonel Sanders, but there is a workaround. If you go to the state legislatures in Article 5 of the constitution, two-thirds of state legislatures can pass resolutions calling for a congressional term limits convention, and then the states can bypass Washington D.C., meet in the convention, propose the amendment themselves, and then ratify the amendment themselves if 38 states sign off on it. We’re working on those two approaches. We’re in Washington recruiting support for our bill there, among members of the House and Senate, but we’re not taking that for granted. Nick T.: We’re also in dozens of state legislatures right now lobbying them to propose term limits on Congress via the convention. We’ve already gotten this passed in Florida, where I live, gotten it passed in Missouri and Alabama, and we’ve done so with bipartisan support. We’ve proved the concept, we just need to scale this and get more states on board. J.R.: Let’s talk about the proof in concept and the reasons for it. I think we kind of jumped the chain here without explaining why term limits are important. Can you elaborate why term limits are a necessary thing in our system of government? Nick T.: Sure. Yeah, well as I mentioned before, our country is plagued by an epidemic of uncompetitive and uncontested elections. We think maybe it’s bad at the federal level where 10% of elections are uncontested. At the state level it’s even worse. In some states only a quarter of all the elections feature more than one candidate on the ballot for state legislature. Here in Florida, before we got term limits on our state legislature, over half of the elections for the state legislature were canceled every two years due to a lack of competition. If you look at when serious goal-oriented people run for office they choose to do so in open seat races. If incumbents are spending decades on end in Washington those open seat races rarely come to pass. The primary goal of term limits is to make elections competitive again, give voters a real choice, jettison those incumbents, and get more candidates running for office so that voters can have meaningful choice. What we tend to accomplish with that is getting legislators who are actually closer to the people and have to appeal to voters. Nick T.: They can’t just rely on PAC money. They can’t just rely on name recognition or sending mailers out of their federal offices to get re-elected. They’re actually going to have to depend on voters. They’re actually going to have to listen to the issues that voters care about, and they’re actually going to have political courage to tackle some of those big problems like the national debt. Term limits are going to give you fresh ideas, they’re going to give you fresh faces in political office. You’re going to get folks with business sensibilities and state sensibilities that you don’t typically see right now because most members of Congress have become creatures of habit, they’ve become creatures of Washington. At best, what we have now is ineffective. At worst, it is corruption. It is pay to play politics. We have members of Congress who are spending hundreds of thousands of dollars out of their campaign accounts on personal vacations and lavish living. Nick T.: We have members of Congress who are running fraudulent charities. We have insider trading. We have millions of dollars that were paid out in undercover sexual harassment settlements on behalf of members of Congress. Term limits will not only give you, I think, more energy, more forward thinking from elected officials, but it will also help you curb corruption, which is very, very important because people are losing trust in the political system thinking that elected officials are compromised. J.R.: Again, if you don’t think that this is a bipartisan issue just look at Ed Rendell and Bill Daly coming out in favor of this, as well as it being kind of a Republican initiated idea, at least back in the ’80s and ’90s. Nick Tomboulides, you are the Executive Director of U.S. Term Limits, tell me regarding … you get a lot of people to pledge to support this thing, particularly when they’re freshmen or just challengers. How many people stick around? How many people continue through with the process? Nick T.: Are you asking how many people actually keep their word? J.R.: Yeah, pretty much. I don’t need a specific, but do you have maybe two-thirds, or whatever, they actually say, “We’re gonna rock it”? Nick T.: Well, it’s interesting, 30 years ago there was another term limits pledge that circulated and it asked politicians to step down from office after a set number of years. If you ran for Senate you’d say I’m going to serve two terms and then I’m going to get outta dodge. We thought that would help set an example for folks who wanted term limits and if enough elected officials do it then it would eventually become a tradition, almost like presidential term limits were a tradition for the first 150 years of our history. It didn’t really work out like that. What we saw was that only the good people in Congress tended to sign that pledge. The bad ones would either refuse to sign it or they would sign it and break it. Back then, despite that, about two-thirds of those who had signed that self-limit pledge did actually step down from office. About one-third were [inaudible 00:23:48] who just totally forgot about it and some of them are still in office today, like Susan Collins, for example. She pledged to serve two terms, I think she’s now looking at running for a fifth term in two years, which is excessive. Nick T.: The pledge has evolved. It’s now totally different. It doesn’t ask members to step down after a set number of years. It only asks them to cosponsor the constitutional amendment for term limits on all of Congress. If that amendment is ratified it would hold House members to three term limits, six years. Senators to a two term limit, 12 years. What we’re seeing is about 95% of the folks who signed this pledge do stick with it once they get to Washington. It has been a lot more effective than the old pledge. It is getting traction. We’ve got about 60 members of Congress, House, and Senate who’ve signed this pledge. The bill gets introduced every two years, gets a lot of cosponsors, and we think it is going to get only more traction in the next few years as people increasingly call for term limits. J.R.: I know I have to let you go. I know you’re busy and you’ve got some other stuff to do, but I got to ask you about that three terms thing in the House of Representatives. J.R.: Really you get the sense that after three terms a lot of these representatives, out of 435, they’re only starting to get their feet wet and get familiar with the program. Why do you think that three terms is sufficient for a citizen legislator? Nick T.: It’s interesting because we have senators and House members who’ve been there for 40 years, who I think you and I would agree still don’t know what they’re doing. Nick T.: We’ve got members of the House on the Internet Committee who don’t know how to turn on a computer, for example. At the same time, we have a lot of congressmen who get elected for the first time and when they step in the office they know right off the bat what they’re going to do. They have a policy agenda and they tend to stick to it. In this era, this information-driven era, that we have of the Internet where most of the information about Congress and about government is publicly available online you can get up to speed before you even get elected to Congress. I don’t think three terms is too short by any stretch. In fact, for most of our country’s history, members of the House only served two terms on average. That changed around the turn of the 20th Century due to advanced transportation and some amendments that changed the complexion of government. Nick T.: The reason we went with six years is sort of a reflection of how the framers of the Constitution wanted the House of Representatives to work. They believed that it would be a lot more democratic. They wanted more turnover. They wanted it to be rough and tumble, very close to the people, and that’s why they chose a two-year term and that why we chose a six-year term limit. We think it allows for a wide diverse array of Americans to come into Congress, serve for a little while. You don’t have to give up your vocation. If you started a business you can step away for a few years, make a difference, and then go back to your vocation. It doesn’t become a career and that’s really the most important takeaway. You don’t want political office to become a career. J.R.: Yeah, that’s a great point. Obviously, I do this as a hobby, but as a politico I’m thinking to myself that the power resides in the committee chair and that honestly is not what we want the House of Representatives to be. J.R.: We want the power to reside in the 435 member body. Nick T.: Yeah. One of the reasons it’s so difficult for a new member to have influence now is because the gap between the newest members and the longest serving member or members is often 30, 40, even 50 years. If you had a term limit and no one could stay in the House for more than six years there would be no seniority gap. You’d actually have to assign positions, like committee chairmanships, based on merit and other factors instead of who’s been on this Earth the longest. That would be a very positive change to the system. J.R.: Well, Nick, this has been a great conversation. I really appreciate the fact that you’ve come on the podcast to educate us a little bit more about this. What are your key takeaways, I guess, from this particular election cycle and what do you want folks to be motivated about regarding U.S. 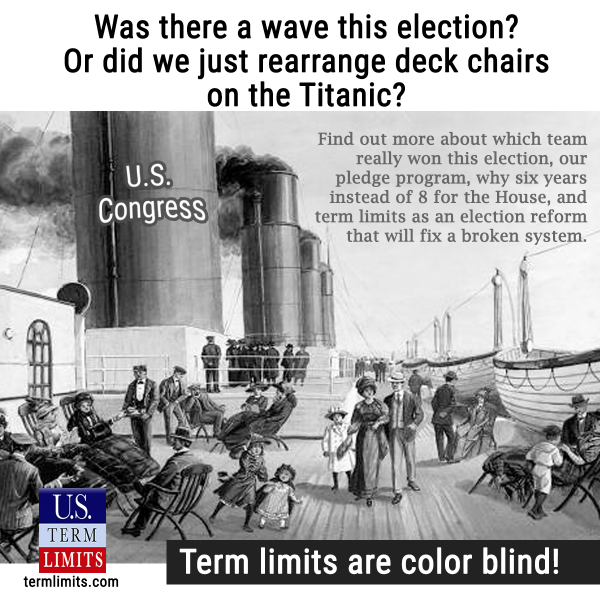 Term Limits as we move forward? Nick T.: I would ask folks on both sides of the aisle to do some reflecting and ask yourselves when my party takes over Congress is that really a silver bullet, is that really a panacea, does the policy agenda that I’ve been pining for really get enacted in most of these cases? From my vantage point, it doesn’t happen. The reason it doesn’t happen is because Congress is not beholden to the people. They are focused exclusively on re-election, they are focused exclusively on building empires, accruing seniority in Congress. Like I mentioned before, we can’t keep changing the captain of the ship. We have to realize the ship itself has a problem and we need to fix that problem. That problem is careerism. That problem is complacency and the lack of political courage that you get when people are allowed to stay in Washington for so long. Upon that reflection, I think most people conclude that we do need term limits on Congress, but I would encourage your listeners go to our website, check us out, download No Uncertain Terms on iTunes or Stitcher, wherever, and get involved in this movement. Nick T.: Our country is already convinced. Like I said, 80% of people already want term limits. The question is how do we get it done? How do we make the political class do it for us? Our organization has the answer to that. I would just tell you guys get involved and thank you for all your support. J.R.: Nick, thank you so much for being on the podcast. Again, I can’t echo that enough, go listen to the No Uncertain Terms podcast. It is absolutely phenomenal. You’ll enjoy it. Nick, thank you. J.R.: That’ll do it for another J.R. Hoeft Show. Really appreciate Nick Tomboulides of U.S. Term Limits coming on the program. Don’t forget to follow me on social media. I’m @JRHoeft on Instagram, Facebook, and Twitter. You can find me there. Of course, like, share, review the program. That is a fantastic way to support the show if you do that on Google podcasts, Apple podcasts, or your favorite podcatcher. If you like what you hear then please spread the word. Until next time, I’m J.R. Hoeft.